Fans watch highlights from the final game of the 2001 World Series in which the Diamondbacks clinched the World Series on a tv just above the World Series trophy. Pat, left, and Rich are brothers from Pittsburgh who now live in the Phoenix area. 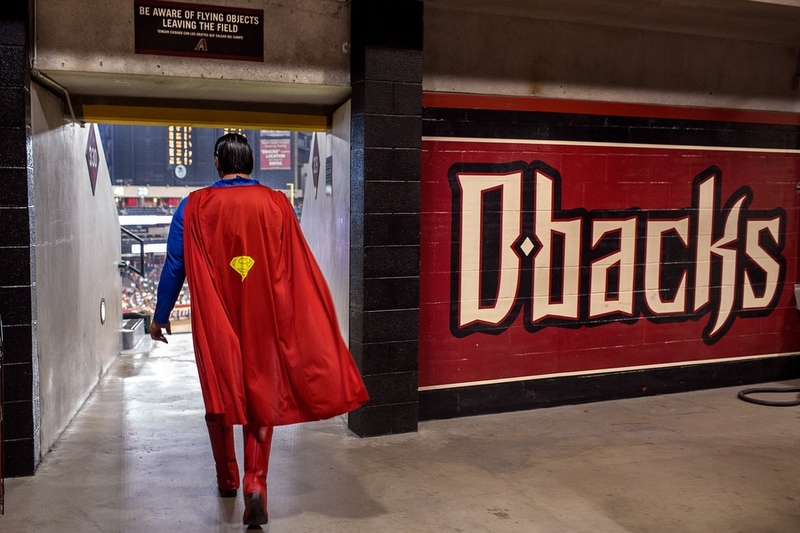 A man dressed as superman walks around Chase Field giving fans high fives and taking pictures. From left, Michael, Nick and Matt cheer on the Pirates. Cindy McBride, better known as "Flag Lady," has cheered on the Diamondbacks at every home game since 2002, two games excepted. She sews and designs flags for each Diamondback regular and waves them in the upper deck whenever they bat or make a good play. She said the umpires said they were feeling left out so she made the umpires flags too. Bud Nielson took his granddaughter Mackenzie to her first game. She's 6 months old. Christina dives into the pool located just past the right-center field wall after a home run ball fell in it. Bobby Freeman is the Diamondbacks organist. He wears number 88 for the number of keys on a keyboard. He started playing accordion in 4th grade and hasn't stopped playing music since. A Diamondbacks pitcher warms up in the bullpen. Fans look at an exhibit showing the process of making a bat from a piece of lumber. From left, Frank, Adrienne, their son Aiden and his cousin Favian share a light moment during the game. Fans wait for players to return to the dugout to try and get autographs.